Checked to work on 40mhz 4 Channel Helicopter Radios. 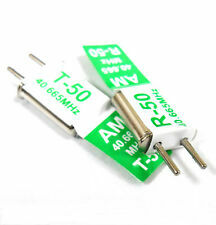 To suit 40 MHZ Frequency Radio Kits. FM Crystal 40.985 (1 pair). Checked to work on 40mhz 4 Channel Helicopter Radios. To suit 40 MHZ Frequency Radio Kits. This frequency can not be used in the UK for rc model use however can be used elsewhere. FM Crystal 40.770 (1 pair). Checked to work on 40mhz AM 4 Channel Radios. 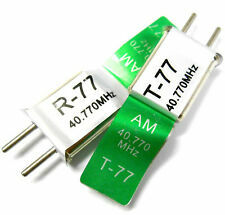 To suit 40 MHZ AM frequency radio kits. AM Crystal 40.695 (1 pair). Checked to work on 40mhz AM 4 Channel Radios. 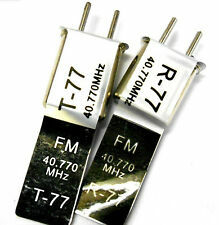 To suit 40 MHZ AM frequency radio kits. AM Crystal 40.770 (1 pair). Checked to work on 40mhz AM 4 Channel Radios. 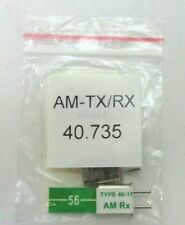 To suit 40 MHZ AM frequency radio kits. AM Crystal 40.665 (1 pair). Checked to work on 40mhz 4 Channel Helicopter Radios. To suit 40 MHZ Frequency Radio Kits. This frequency can not be used in the UK for rc model use however can be used elsewhere. Checked to work on 40mhz 4 Channel Helicopter Radios. 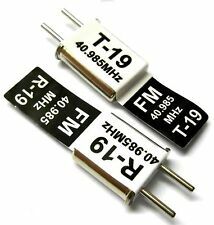 To suit 40 MHZ Frequency Radio Kits. FM Crystal 40.815 (1 pair). Checked to work on 40mhz 4 Channel Helicopter Radios. To suit 40 MHZ Frequency Radio Kits. FM Crystal 40.675 (1 pair). Checked to work on 40mhz 4 Channel Helicopter Radios. To suit 40 MHZ Frequency Radio Kits. FM Crystal 40.685 (1 pair). This is a used receiver crystal. Checked to work on 40mhz 4 Channel Helicopter Radios. To suit 40 MHZ Frequency Radio Kits. FM Crystal 40.725 (1 pair). Checked to work on 40mhz 4 Channel Helicopter Radios. To suit 40 MHZ Frequency Radio Kits. FM Crystal 40.915 (1 pair). Checked to work on 40mhz 4 Channel Helicopter Radios. To suit 40 MHZ Frequency Radio Kits. FM Crystal 40.975 (1 pair). Checked to work on 40mhz 4 Channel Helicopter Radios. To suit 40 MHZ Frequency Radio Kits. FM Crystal 40.855 (1 pair). Checked to work on 40mhz 4 Channel Helicopter Radios. To suit 40 MHZ Frequency Radio Kits. FM Crystal 40.795 (1 pair). Checked to work on 40mhz 4 Channel Helicopter Radios. To suit 40 MHZ Frequency Radio Kits. FM Crystal 40.775 (1 pair). Checked to work on 40mhz 4 Channel Helicopter Radios. To suit 40 MHZ Frequency Radio Kits. FM Crystal 40.935 (1 pair). Checked to work on 40mhz 4 Channel Helicopter Radios. To suit 40 MHZ Frequency Radio Kits. FM Crystal 40.925 (1 pair). Checked to work on 40mhz 4 Channel Helicopter Radios. To suit 40 MHZ Frequency Radio Kits. FM Crystal 40.785 (1 pair). 40.675MHz AM/FM single conversion receiver crystal - channel 51. Checked to work on 40mhz 4 Channel Helicopter Radios. To suit 40 MHZ Frequency Radio Kits. FM Crystal 40.735 (1 pair). Checked to work on 40mhz 4 Channel Helicopter Radios. 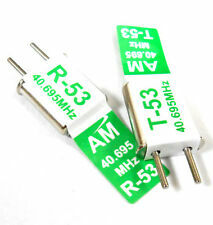 To suit 40 MHZ Frequency Radio Kits. FM Crystal 40.765 (1 pair).